We are a very unique place for fly fishing. We have many different styles of fishing that can be used in a day of fly fishing. We can cast at schools of jacks, bluefish, and ladyfish inshore during the warmer months. Sometimes these schools have 1000's of fish which can reach 20+ pounds. This is the easiest style of fly fishing that we have. We also have great trout fishing year-round. This is either blind casting where trout are present or casting at small schools of trout that are popping bait at the surface. Some of these trout reach in excess of eight pounds. Off of the beach during the spring and summer is where our power fish are. This is all sight fishing. 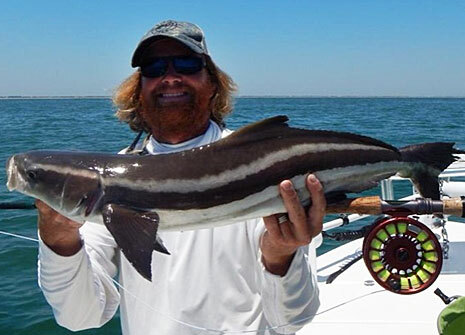 We can cast at cobia, which can exceed 40 pounds, cruising on the back of manta rays. These fish are extremely powerful and will take you to the backing of a 10 weight in the blink of an eye. They do not give up the fight until they are in the cooler or released. On this same trip you can also have shots at rolling tarpon crushing the pogy pods, as well as cruising schools of jacks, bonita, and swimming trippletail.There is also sight fishing sharks that are 100+ pounds following the shrimp boats cruising off the beach. Behind these boats you will also encounter tarpon and cobia. Now to my favorite type of fly fishing – sight fishing for tailing and pushing redfish. This is a year round fishery. During the winter months, our water is clear and there are huge schools of redfish trying to stay warm. 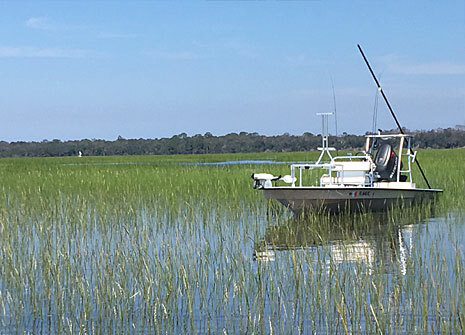 This is a fun style of fishing where we pole the oyster flats, keeping an eye out for the fish. 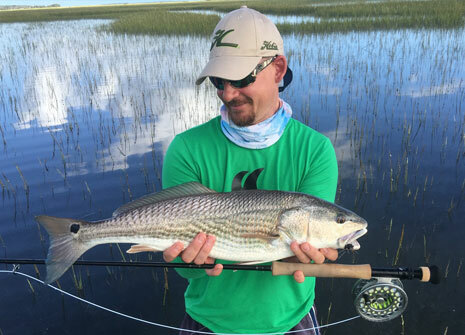 During the other seasons the redfish will either be tailing or pushing wakes in the creeks. During the floodtide there are numerous tailing redfish (see floodtide fishing page). 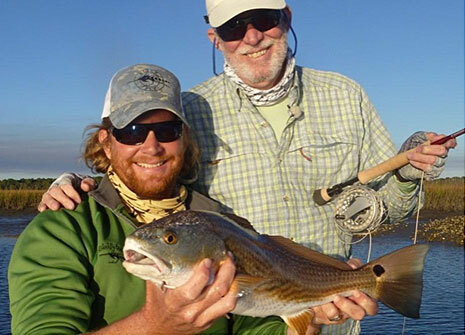 In the early mornings and late evenings you can also throw poppers and gurglers for cruising redfish.